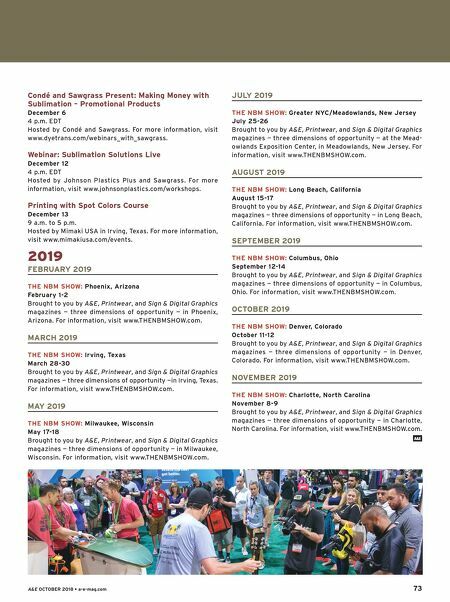 72 a-e-mag.com • A&E OCTOBER 2018 Calendar Upcoming Events OCTOBER 2018 Sandcarving Basics October 4-5 Thursday: 12 to 5 p.m., Friday: 8:30 a.m. to 5 p.m. Hosted by Rayzist in Vista, California. For more information, visit www.rayzist.com. Sandcarving Seminar October 5-6 Friday: 3 to 6 p.m., Saturday: 9 a.m. to 5 p.m. Hosted by IKONICS Imaging in Brea, California. For more i n fo r m a t i o n , v i s i t w w w. i ko n i c s i m a g i n g .c o m / i ko n i c s/ upcoming-classes. Webinar: Sublimation Business Startup – What You Need to Know October 9 8 a.m. and 4 p.m. EDT Hosted by Sawgrass. For more information, visit www.saw- grassink.com/Resources/Webcasts/Webinars. Webinar: Your Guide to Sublimation Success in the Awareness Market October 9 3 p.m. EDT Hosted by Coastal Business Supplies and Sawgrass. For more information, visit www.coastalbusiness.com. Webinar: Making Money with Sublimation – Create a Signage Program October 10 4 p.m. EDT Hosted by Johnson Plastics Plus and Sawgrass. For more information, visit www.johnsonplastics.com/workshops. Bogi's Sandcarving Workshop October 13-14 Hosted by Bogi's Garage and IKONICS Imaging. For more i n fo r m a t i o n , v i s i t w w w. i ko n i c s i m a g i n g .c o m / i ko n i c s/ upcoming-classes. 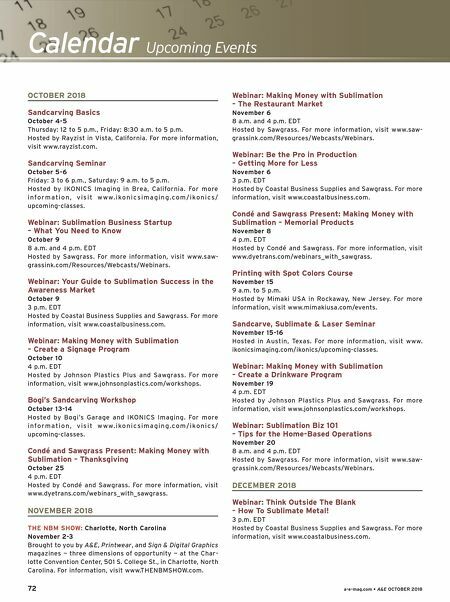 Condé and Sawgrass Present: Making Money with Sublimation – Thanksgiving October 25 4 p.m. EDT Hosted by Condé and Sawgrass. For more information, visit www.dyetrans.com/webinars_with_sawgrass. NOVEMBER 2018 THE NBM SHOW: Charlotte, North Carolina November 2-3 Brought to you by A&E, Printwear, and Sign & Digital Graphics magazines — three dimensions of opportunity — at the Char- lotte Convention Center, 501 S. College St., in Charlotte, North Carolina. For information, visit www.THENBMSHOW.com. Webinar: Making Money with Sublimation – The Restaurant Market November 6 8 a.m. and 4 p.m. EDT Hosted by Sawgrass. For more information, visit www.saw- grassink.com/Resources/Webcasts/Webinars. Webinar: Be the Pro in Production – Getting More for Less November 6 3 p.m. EDT Hosted by Coastal Business Supplies and Sawgrass. For more information, visit www.coastalbusiness.com. Condé and Sawgrass Present: Making Money with Sublimation – Memorial Products November 8 4 p.m. EDT Hosted by Condé and Sawgrass. For more information, visit www.dyetrans.com/webinars_with_sawgrass. Printing with Spot Colors Course November 15 9 a.m. to 5 p.m. Hosted by Mimaki USA in Rockaway, New Jersey. For more information, visit www.mimakiusa.com/events. Sandcarve, Sublimate & Laser Seminar November 15-16 Hosted in Austin, Texas. For more information, visit www. ikonicsimaging.com/ikonics/upcoming-classes. Webinar: Making Money with Sublimation – Create a Drinkware Program November 19 4 p.m. EDT Hosted by Johnson Plastics Plus and Sawgrass. For more information, visit www.johnsonplastics.com/workshops. Webinar: Sublimation Biz 101 – Tips for the Home-Based Operations November 20 8 a.m. and 4 p.m. EDT Hosted by Sawgrass. For more information, visit www.saw- grassink.com/Resources/Webcasts/Webinars. DECEMBER 2018 Webinar: Think Outside The Blank – How To Sublimate Metal! 3 p.m. EDT Hosted by Coastal Business Supplies and Sawgrass. For more information, visit www.coastalbusiness.com.